For the final day of cooking One Sauce, Two dishes, under BM#65, I made Butterscotch Sauce and for the first dish, it was an Eggless Butterscotch Custard Cake. So the second day say Butterscotch Ice Cream made with the sauce. The Ice Cream is my regular No churn Ice Cream made with just Cream and Condensed Milk. For the slight yellow colour, I used saffron strands and to get that crunchy effect, added the broken chips. 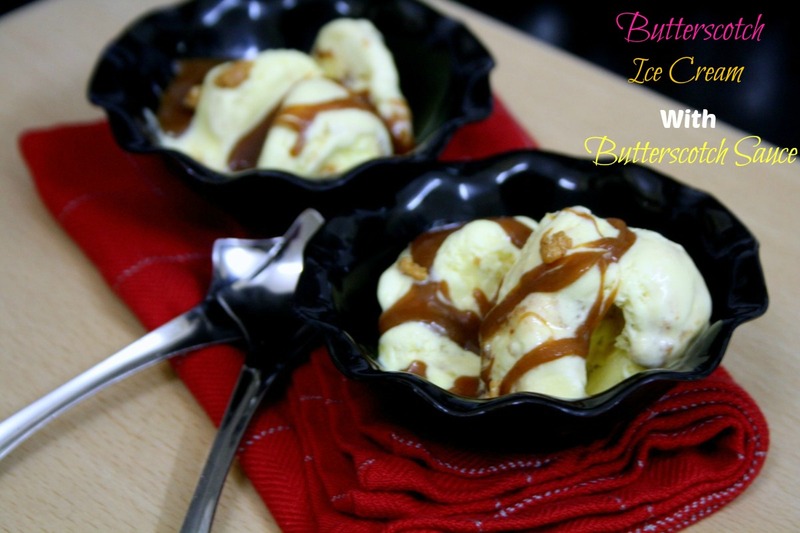 The Butterscotch Sauce was poured over the ice cream and I had to set it again before clicking as I was experimenting with my new camera. I am still trying to find my spot with it. When I removed it, I saw the colour turned a bit darker and it set as hot chocolate made with coconut oil. It also tasted as toffee with ice cream. Warm milk and add the saffron strands, let it stand for some time till it melts. In a mixing bowl, take fresh cream, beat for a minute until frothy and creamy. Next add condensed milk and beat it again for a minute. Then add butterscotch essence, 1/4 cup Butterscotch sauce, beat again. Blend well and set it aside. Take butterscotch chips in a mixer and grind it to a coarse powder. Add it to the cream mixture. Add the saffron milk. Mix with a spatula. Pour half of the mix into a freezer safe container. 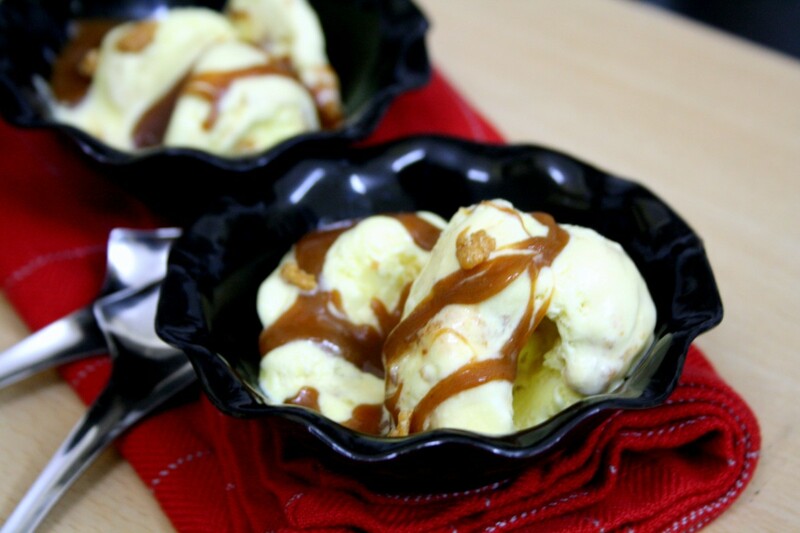 Once it sets, remove half the ice cream, pour the remaining butterscotch sauce over it in a swirl movement. Next, set the other half of the remaining ice cream mix on top. Close with a lid and freeze for at least 6-8 hrs. I kept it overnight. Scoop and Serve with Butterscotch chips and sauce. Ice cream looks mouthwatering! Must have tasted great! both my kids love this flaour ! bookmarked to try..
Valli awesome pics. and ice cream is yum eyeing your bowls. We don't get butterscotch flavored ice cream here in the US. There's butter pecan but not this. Will have to try this some time. Valli, would'nt mind having some..looks fantastic. Ice cream looks so yummy…Even I wanna have a bite now.!! One of my favourite flavor, been ages i had butterscotch icecream, feel like having few scoops now. I would love to have some now.Superb.